I didn’t want to like All-Star Western. Hell, I didn’t even want it to begin with. But the wife’s a fledgling comics reader, a miniscule fraction of a demographic DC is trying to reach with the New 52, so I added the title to my pulls at her request. Gotta do our parts for the industry, right? I have a so-so relationship with westerns; I like me some classic Eastwood, some of the more recent film remakes like 3:10 to Yuma and True Grit are okay. Western comics…there’s no way that rough n’ rowdy spirit of lawlessness and picturesque backdrop setting can be captured through comic art so I have traditionally avoided the genre. I think I’m right when I say All-Star realizes likewise, which is why the book takes a completely different direction and for the most part, it works. 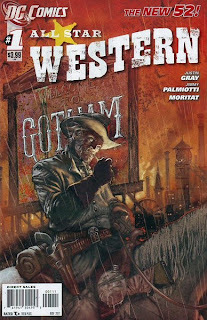 Instead of starring Jonah Hex out on the range, writers Jim Palmiotti and Justin Gray drop the complexion-challenged roughneck in the middle of a bustling, growing yet grimy Gotham that eerily looks like steampunk London, and like the Whitechapel murders of that city in the late 19th Century, someone’s hacking up Gotham’s prostitutes. Fish-out-of-water Hex is hired by Arkham Asylum progenitor Amadeus Arkham to collect bounty on the murderer, who apparently is aware of Hex’s presence and sends him a gruesome message: get out and get out now. Story-wise, this book has me for the time being. If Gray and Palmiotti had set their tale in the real West, I probably would’ve never have read it and would let the wife have her enjoyment. But I like a good mystery and the fact events are unfolding through Dr. Arkham’s narrative gave the story a very different P.O.V, although – and the wife thought so as well – the narrative gets too wordy in some panels. As for the art, artist Moritat’s thick line work is distracting to me in scenes where there’s plenty going on in the background, and the attempt at faded, almost sepia-toned colors in some shots looks unnatural. Now that all of the 52 are out on shelves, many fans are faced with choosing which books to cut from their monthlies. All-Star is one of the eight titles I pulled and one of the five I’ve chosen to keep – for now. Verdict: 3.5 stars out of 5. 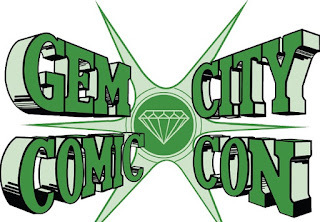 Brian Cee is a contributing writer at Champion City Comics.